~200 grams of meat/ person, either pork or beef. It needs to be thinly sliced hot pot meat. This kind of meat is usually available at Asian supermarkets. Amount of veggies will vary based on how many you have coming over- I invited four friends and just got whatever the smallest packages of these veggies were available, and we had PLENTY to eat. You will also need steamed rice to eat with this! This is traditionally eaten with everyone gathered around a table that has a portable burner with a pan set up on it. There is a traditional cast iron pan you can use- I just used a pan I had on hand with an electric burner. 1. Pour sauce ingredients into a pan, and bring to a boil. Remove from heat and set aside to be used when you cook. 2. Prepare veggies by cutting off ends, discarding wilted leaves, and cutting into bite sized pieces. 3. Drain and rinse shirataki noodles. 4. Set meat on a plate to have ready to go. 5. Cook! First cook meat, sprinkling brown sugar over the top to caramelize it. Pour over a bit of sauce. When cooked, push to one side of the pan and add in veggies and more sauce. Let everything stew until veggies are tender. Then, dig in! 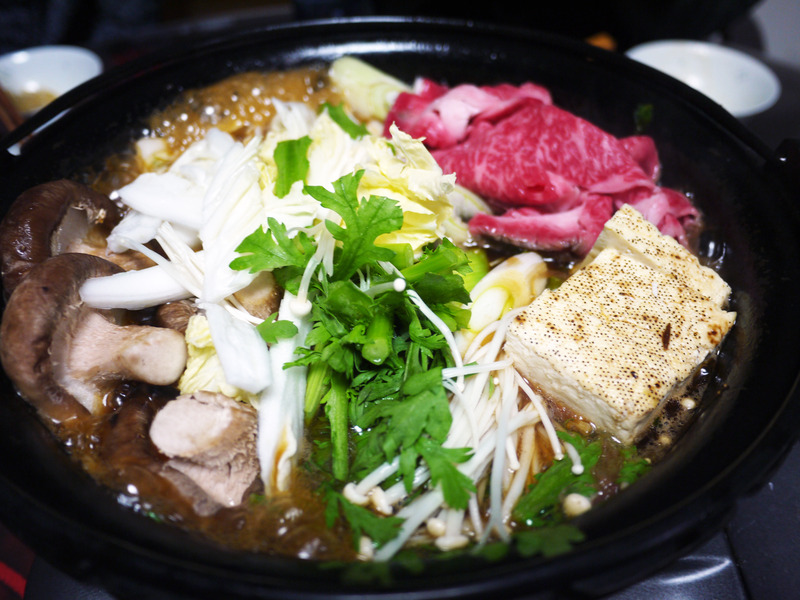 “When the cold winter winds blow and it seems like summer will never come again, there’s nothing like filling the home with the always heartwarming and crazy delicious wonder that is sukiyaki. 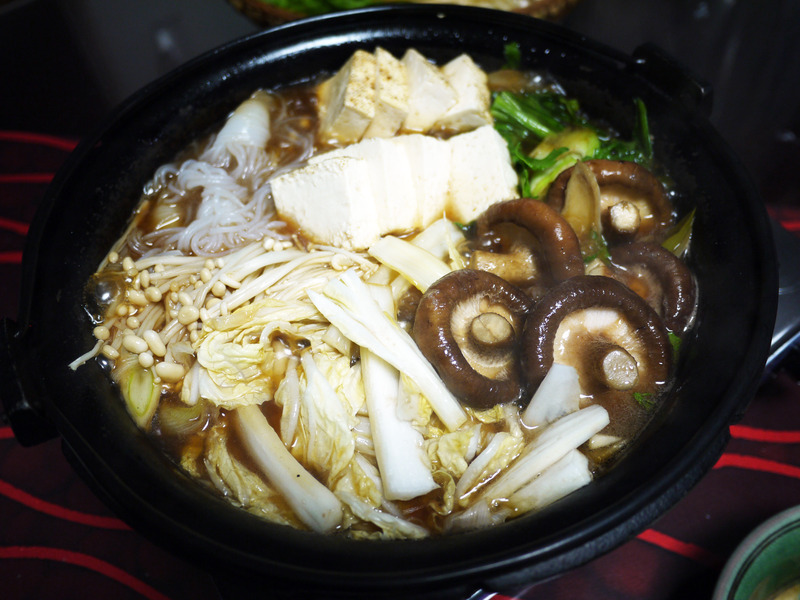 Some cross between a soup and a stew, sukiyaki is basically thinly sliced beef, tofu, noodles, Asian mushrooms, and a whole ton of vegetables simmered in a sweet and salty saucy soup. When the ingredients are cooked, they are picked out of the simmering liquid, dipped in a raw, beaten egg, and then eaten with a bowl of rice. 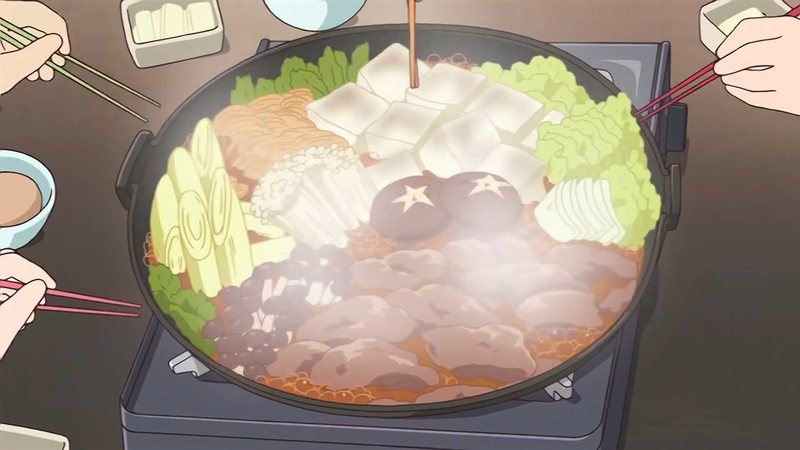 In anime, sukiyaki is often depicted as a happy and warm activity that involves and brings together many people. Because this dish is generally cooked at the table using a low rimmed cooking pot set on a portable burner, and everyone just reaches in to pick up meat and veggies with their chopsticks, it’s a very communal and fun experience, best shared with friends and family. 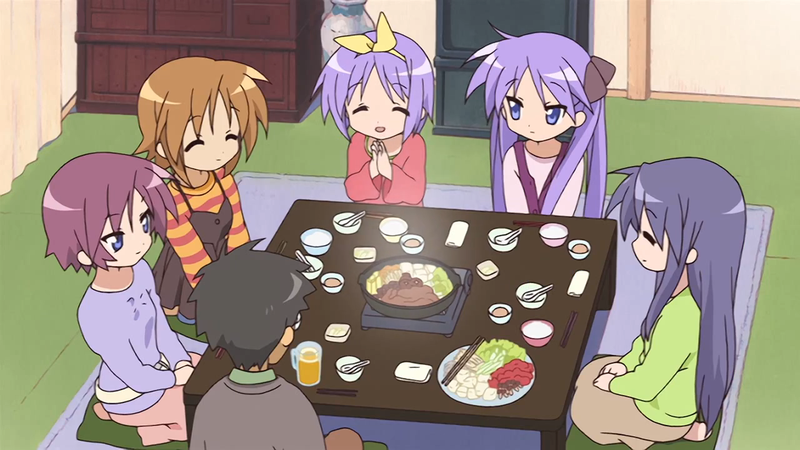 Eating sukiyaki at a kotatsu (a low, heated table with a blanket skirt to keep the warmth in) and having everyone gathered around the pot of hot food makes for a very warm experience, both for the heart and the body. 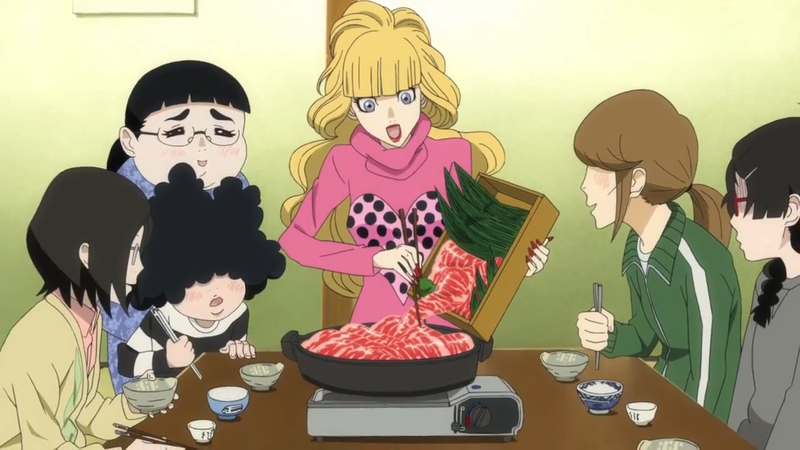 Instances of sukiyaki can be seen everywhere, including the anime Lucky Star, Minami-Ke, Kuragehime (Jellyfish Princess), Natsume Yuujinchou, and Ao no Exorcist…. 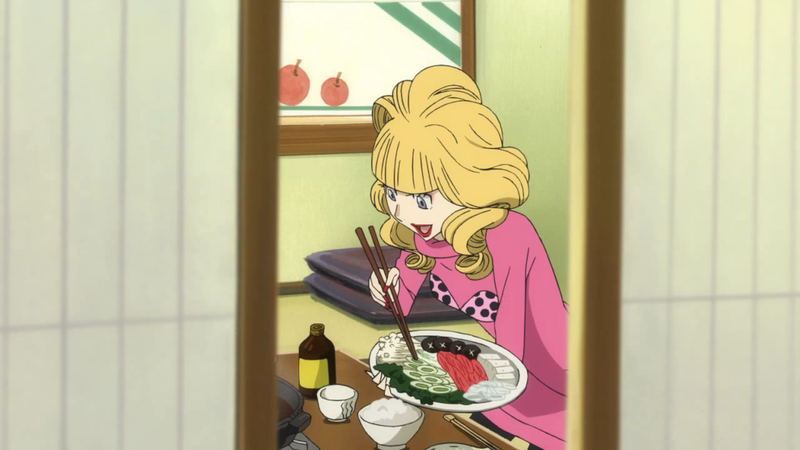 there’s plenty of other anime where this dish makes an appearance, so keep an eye out for it! 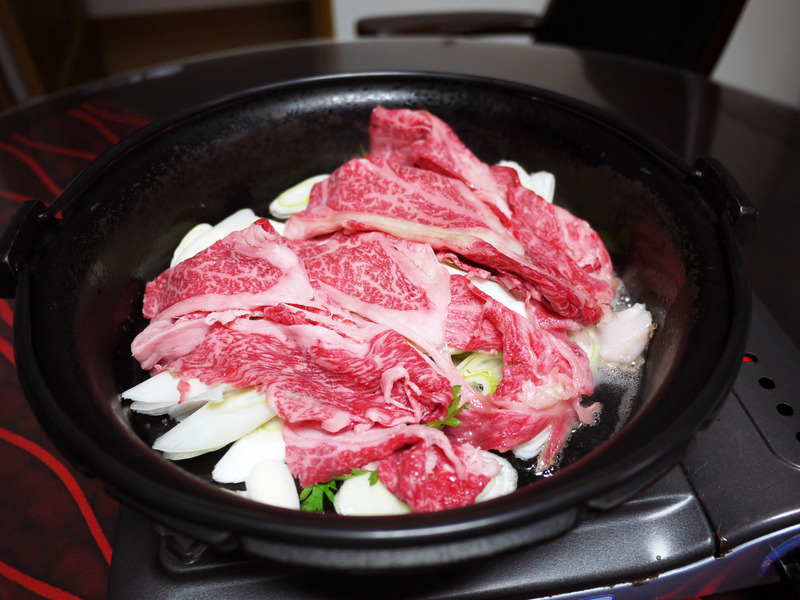 Sukiyaki is a very easy to make meal that is really perfect for a family or group dinner. Everything is made in one pot, and includes all the vegetables and meat you’ll need…. no need to make side dishes or anything, other than some rice! Since everything is cooked at the table, it’s important to prepare all of your ingredients before hand so that you’re not scrambling to cook and cut vegetables while trying to enjoy your meal. Basically, this means you should sharpen your knife and start cutting! 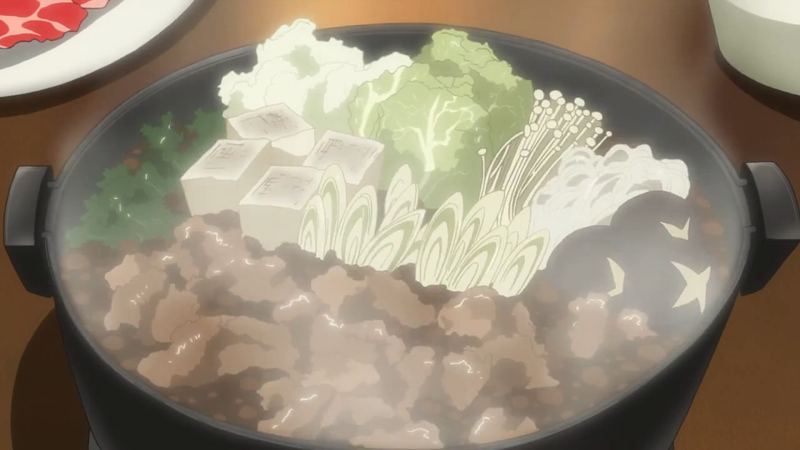 While sukiyaki is typically prepared at the table on a portable burner, this may not be possible for everyone. If you don’t have a portable burner or hotplate, you can also make it on the stove. It won’t be quite as interactive or communal this way, since it will all be cooked in the kitchen (unless your stove is near your eating area?) but a viable option could be to cook it on the stove and then set the pot directly on the table (make sure to protect your table with a trivet!) for everyone to eat from. Or… you could pull a couple chairs next to the stove and enjoy it that way? If you cook this at the table, please be careful that you don’t inadvertently contaminate your cooked food with the raw meat. A good way to ensure safety is to have two separate pairs of cooking utensils (I like to use chopsticks or tongs) that can be used to handle the raw meat and cook the ingredients in the pot. 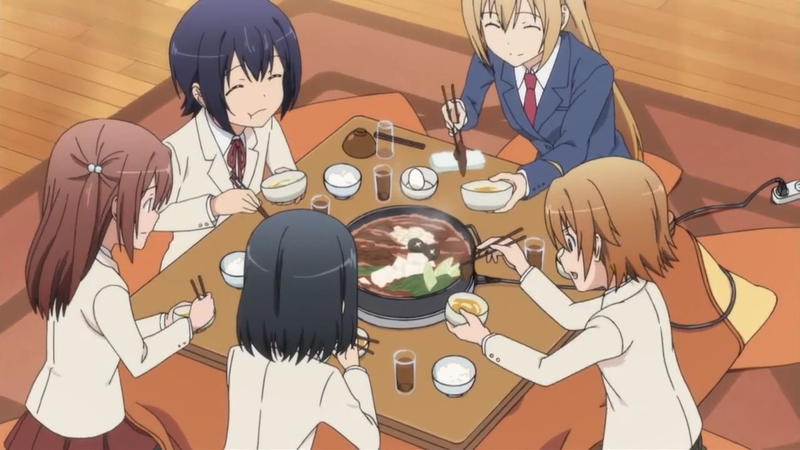 And one last thing to note: this recipe can be scaled up or down to accommodate any number of people, but since everyone will be reaching into the same pot to retrieve food, you’re limited by the size of your pot, the size of your table, and the number of people that could comfortably share one sukiyaki pot. I think 6 (maybe even 8?) people could easily share one sukiyaki pot, but any more than that and you may run into conflicts over how quickly the food cooks. 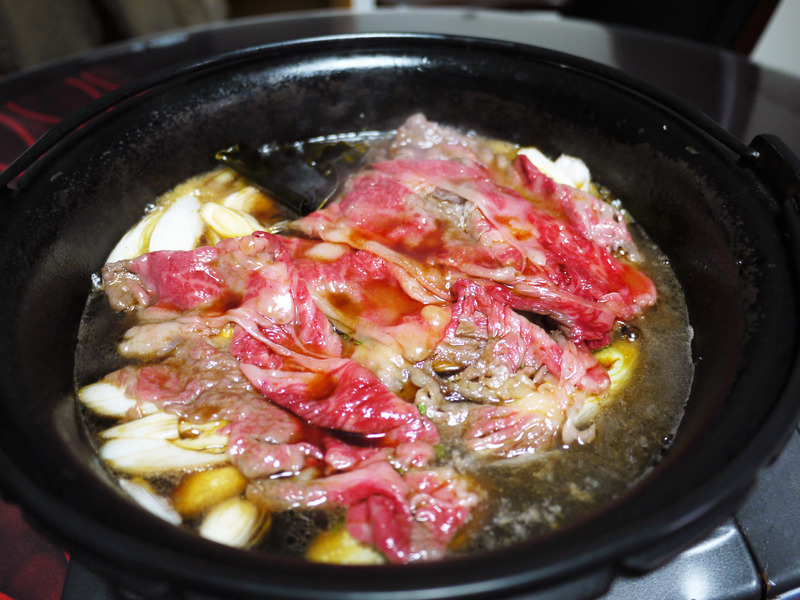 In cases of parties of 10 or more people, two pots of sukiyaki might work better. Use your best judgement! Also, the ingredient amounts for the pot is really more of a guideline than anything else. Just add more of the sauce ingredients as you go along to ensure the flavour remains strong enough for your liking. That means if you want it saltier, add more soy sauce. Sweeter is more your taste? Add more sugar. Are you a heavy meat eater? Buy more beef. Love vegetables? Cook more cabbage and chrysanthemum greens. It’s really that easy! Other than that, enjoy! 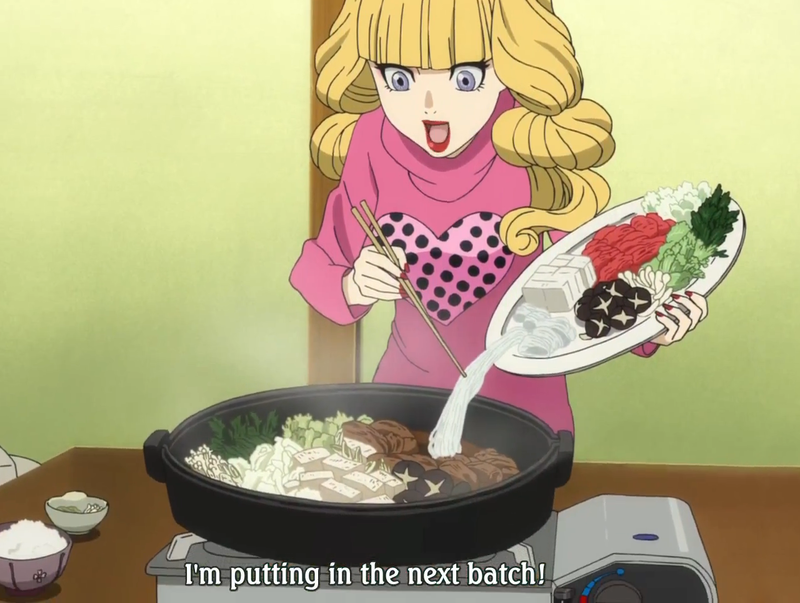 Cooking sukiyaki shouldn’t be too stressful or hard…. especially since everything can be prepared well ahead of time. Not all green onions are the same… In this dish, I recommend using Japanese green onions, which are called “negi” in Japanese. This vegetable is very long and much thicker than typical green onions, and is almost like a green onion crossed with a leek. Japanese green onions can be found in some Asian grocery stores, but rarely in Western stores. If you cannot find it, just use regular green onions (or, even leeks if you like) instead! Beef is the meat of choice in this dish (pork can also be used). It should be sliced very thinly and have a good amount of marbling to ensure it is tender when cooked. Typically, sukiyaki meat can be bought pre-sliced from some Asian grocery stores (I find mine at Mitsuwa or the Korean store, Super H-Mart). Some butcher shops may also be able to slice it for you. Buying pre-sliced meat is great since it means that I don’t have to cut it myself, and also that the meat is thin and evenly sliced. 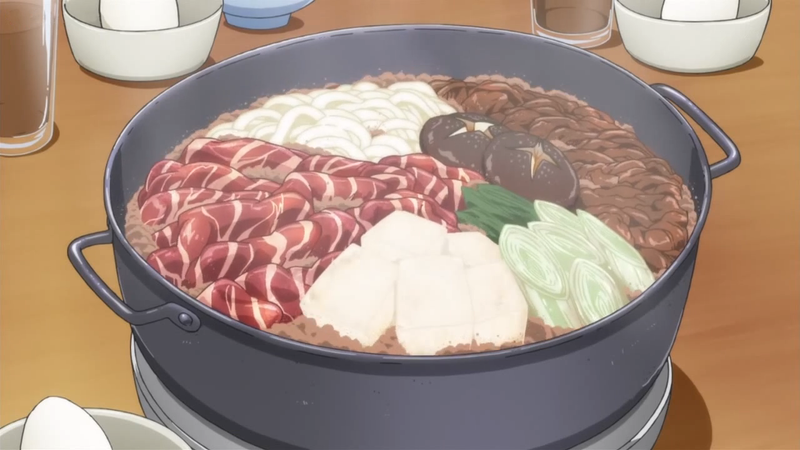 But, if you don’t have access to pre-sliced sukiyaki beef, you can always buy a piece of beef with a good amount of marbling (like sirloin) and slice it at home yourself! The best technique for a thin cut is to partially freeze the meat until it’s stiff, and then slice it with a sharp knife. Slice against the grain at an angle, shaving more than actually slicing the meat to create very thin pieces. Refreeze as you go if necessary. Asian mushrooms are a great addition in this meal, especially because they tend to soak up the sauce as they cook! Typically enoki and/or fresh shiitake are used. 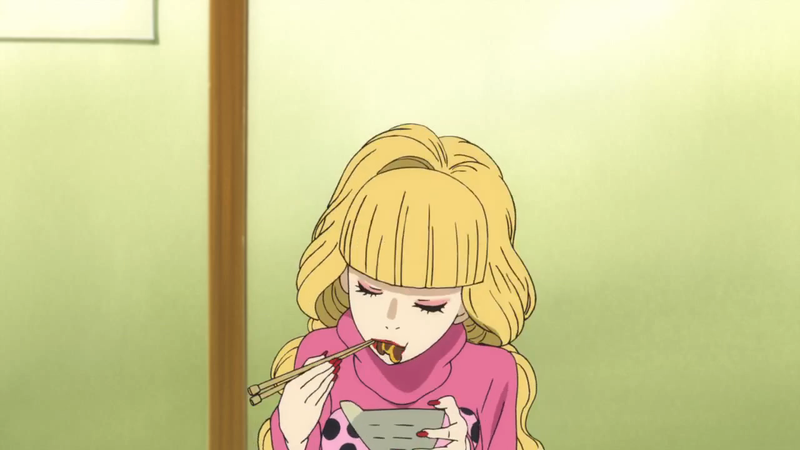 Enoki is found is most Asian grocery stores, usually in packages. Shiitake mushrooms are commonly found in many regular grocery stores (I find them at Whole Foods). Only use fresh shiitake, and not dried, since the dried mushrooms have a much stronger and very different flavour than fresh ones, and will generally be a bit chewy. And, if you really can’t find either mushrooms, you can also use a portobello in a pinch. Chrysanthemum greens (called shungiku in Japanese) is a very fragrant and slightly bitter leafy green vegetable. It can be found in some Asian grocery stores, but pretty much never in Western stores. Since it should be cooked at a low heat to ensure it doesn’t become very bitter or turn to mush, this vegetable does wonderfully when added to sukiyaki. A good substitute for chrysanthemum greens is watercress, or even spinach. 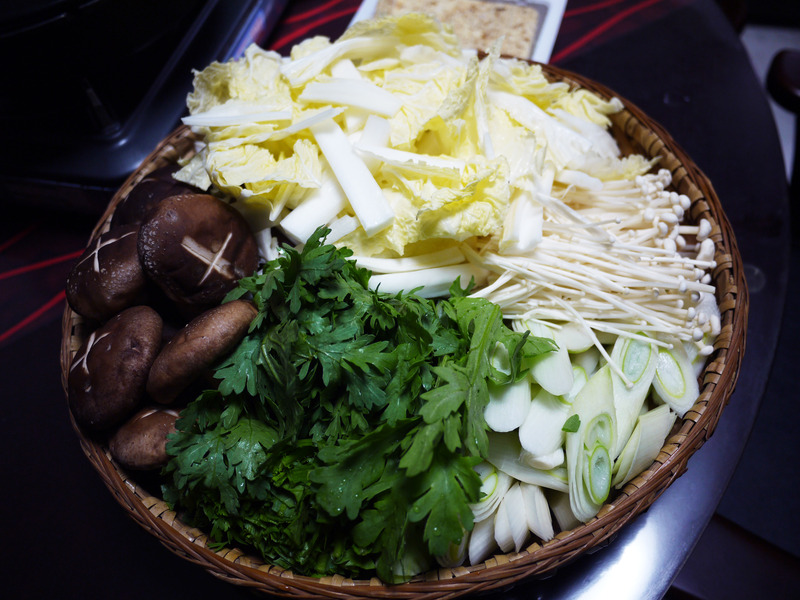 Sukiyaki always includes noodles, and shirataki (konnyaku) noodles are most commonly used. These noodles are made from devil’s tongue yam (also called konjac yam or elephant yam), and while they don’t taste like much, they soak up a lot of the sukiyaki sauce flavour and have an interesting texture. Apparently, they are not supposed to be cooked next to the meat, since it could make the meat tough. Shirataki noodles can be found in Asian grocery stores, usually in packages full of liquid, similar to the way tofu is kept. The noodles may be tied into small bunches or loose. Just drain from the liquid, rinse in cold water, and they’re ready to use! If you can’t find shirataki or konnyaku noodles in your area, you can also use udon as a substitute (find a recipe for homemade udon here!). Udon (as well as mochi) is commonly added at the end of the meal to soak up all the remaining sauce after all the meat and vegetables have been eaten, making for a flavourful and very filling conclusion to your sukiyaki dinner. And, once again, we address the question: are raw eggs safe to eat? Well, I’ll repeat myself and decline to say whether it is or isn’t, since I don’t want to get in trouble! But, what I will say is that you should read up on the topic and carefully make your own informed decision. Please read my post on tamago kake gohan, which also uses a raw egg. The Egg Safety Center is also a good resource regarding this topic. 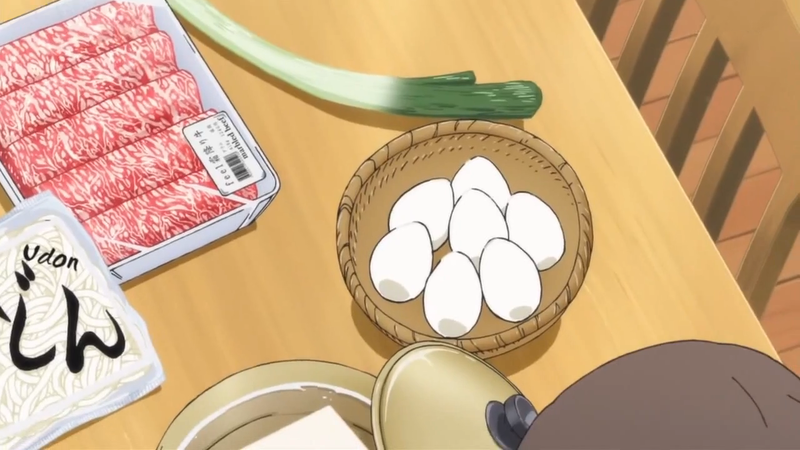 If you’re not comfortable with eating raw eggs, sukiyaki will still taste great without it! Green onions: cut the white part of the Japanese green onions at an angle into 1/2 or 3/4 inch pieces. If using regular green onions, greens may be included as well. Shiitake mushrooms: remove any tough or woody parts of the mushroom stems if necessary. Enoki mushrooms: remove the tough bottom section of the mushroom stems. Separate the mushrooms into several smaller sections. Napa cabbage: separate out leaves and cut into 2 inch pieces. Cut stems into 1/2 inch x 2 inch pieces. Chrysanthemum greens and/or watercress: remove the bottom of the stalks where the stems join. Roughly cut stems and leaves into 2 – 3 inch pieces. Tofu: drain and cut in half lengthwise and 3/4 inch pieces widthwise. Shirataki noodles: rinse noodles in cold water and drain. Beef: to slice your beef, partially freeze the meat until it’s stiff, and then slice it with a sharp knife. Slice against the grain at an angle, shaving more than actually slicing the meat to create very thin pieces. Refreeze as you go if necessary. 2. Heat a medium pan with 2 – 3 inch high sides over medium-high heat. Add in enough oil to coat the inside of the pan. If using a hard fat (lard, tallow), move it around with chopsticks or tongs to coat the pan well and evenly. If using a piece of beef fat, allow the fat to render and produce oil, and then rub it around the pan. Remove excess hard fat or beef fat from the pan before proceeding. 3. Spread green onions evenly at bottom of the pan. Layer a quarter of the sliced beef on top of the green onion. Add mirin, sake, sugar and kombu, stirring carefully to dissolve the sugar without disturbing the meat too much. Bring to a boil and then add soy sauce. 4. When the beef begins to turn brown but is still red in some spots, place enough vegetable, mushroom, tofu, and shirataki noodles as can reasonably fit in the pot on top of the beef and green onions, keeping each item grouped together. 5. Simmer until all the ingredients are cooked through, about 8-10 minutes, gently moving the vegetables so that the uppermost cook in the sauce, turning the shiitake over in the sauce so they cook through evenly, and rotating the tofu, noodles, and enoki so they are coated evenly with sauce. Add water as necessary if there is not enough sauce in the pan, but do not add too much as it will dilute the flavour of the sauce. Also note that the vegetables will produce liquid as they cook. Serve by removing desired items from the pot and placing into a small bowl containing a beaten, raw egg. Coat with the egg and eat with rice. When the majority of the items in the pot have been removed, another serving of vegetables and meat can be added. Place the ingredients in groups in the sauce and simmer as before until cooked through. In order to avoid over cooking ingredients and to make way for the next serving of food to be cooked, clear the pan by simply removing the remaining items and distributing them to the bowls of beaten egg. The food will have time to cool off a bit while resting in the egg, and everyone can still have something to eat while the next portion of meat and vegetables cook. If there is not enough simmering liquid in the pot, add water, but do so sparingly as it will dilute the sauce. If the flavour of the sauce becomes weak, add more soy sauce or sugar to adjust the taste.